Riki Wessels is determined to put the disappointment of missing out on Notts Outlaws’ 2013 Lord’s triumph by playing a key part in this year’s Royal London One-Day Cup final at the Home of Cricket. 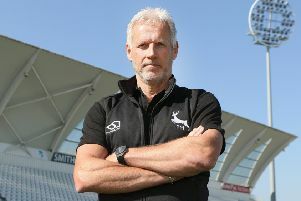 The attacking batsman was on the Trent Bridge playing staff at that time but not picked for the showpiece occasion, in which his team-mates beat Glamorgan by 87 runs in the YB40 final. This time, however, the Australian-born right-hander is an intrinsic part of an Outlaws side that has played an attacking brand of cricket en route to the final, contributing 296 runs from nine innings. He hopes to add to that total significantly in the capital as he prepares to play on a stage that had previously eluded him in his career at Trent Bridge and, before that, with Northamptonshire. “It’s a totally different experience for me from last time. I got told quite well in advance that I wasn’t going to play in the final, so for me it was a bitter-sweet win and quite difficult,” said Wessels. “But this time, win or lose, it’s just nice to have the opportunity to be involved. I’ve been playing now for the best part of 13 seasons to get to be involved in a Lord’s final, so to be a part of it would be quite special. “There’s still a massive amount of prestige around the one-day final. As a Club, four-day cricket is what we are about day in, day out, but if someone dangles that carrot for a Lord’s final, you want to be there and then win it. “It always holds that importance. It’s not the last game of the season, but I think holding it in July is better. When you start playing games in May and the final is not until September, the contradiction of conditions is massive. Wessels has good reason to look forward to playing at Lord’s, too, given the knock he played the last time he walked out to bat there in a List A game. The 31-year-old blasted 132 from 118 balls with 12 fours and seven sixes to lead Notts to a 49-run victory over Middlesex in a Royal London One-Day Cup Group B game in August 2015. He said: “That’s my last memory at Lord’s in a white ball game – it’s not a bad one to have, so hopefully on Saturday that can continue. Nottinghamshire will finish their game with Kent today (Thursday) before travelling down to practice at the Nursery Ground at Lord’s tomorrow afternoon ahead of the match on Saturday. Wessels is looking forward to focusing in on the game after the team were forced to swiftly put the buzz of winning the semi-final against Essex to one side as they moved into consecutive Specsavers County Championship matches. He said: “It was quite phenomenal in the dressing room at Essex. None of us knew it was a record chase until we were sat in the changing room and it came up on the screen. It was quite special and crazy to explain.